Proof Gold American Eagle coins are the official collector’s version of the nation’s bullion coin program. 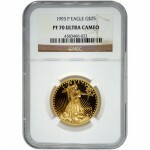 Introduced in 1986, the Gold American Eagle has become the most popular coin series in the world, outselling many of its major rivals and dominating the global market. 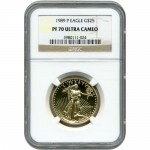 Today, you can purchase a perfect-condition 1991-P ½ oz Proof Gold American Eagle coin on Silver.com. Ships in a protective plastic slab to ensure the coin’s pristine condition. Fifth anniversary release of ½ oz Gold American Eagles! Issued a perfect Proof 70 grade from the Professional Coin Grading Service. Proof coins are produced in a different process than their bullion counterparts. While bullion coins are often mass produced, extra steps are taken to care for the condition of proof coins. They are often minted under extreme pressure and struck multiple times to create a more visually appealing finish. The history of proof production in general dates back to the early 20th century, but it wasn’t until the modern coining era that proof coins started to outstrip bullion products in terms of demand and popularity, due mostly to the sharper rims and more intricate design features. 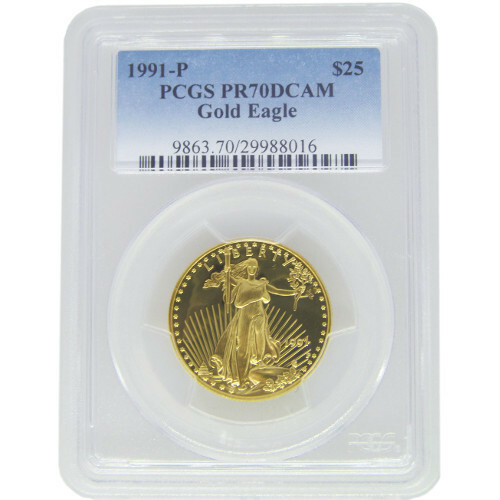 Each of the 1991-P ½ oz Proof Gold American Eagle coins in this product listing has a perfect PR70 grade from the PCGS. This indicates that each coin has its full, original mint luster and no blemishes anywhere on the surface. Deep-cameo means the coin’s design set appears to float above the background field thanks to the sharp contrast between the design’s strong, frosted finish, and the deeply-mirrored, clear finish of the background. On the obverse face of each Gold Eagle you’ll find the Lady Liberty design from Irish-American artist and sculptor Augustus Saint-Gaudens. Originally designed in 1907, it was previously used from 1907 to 1933 on the $20 Gold Double Eagle coin from the US Mint. Miley Busiek’s family of bald eagles is featured on the coin’s reverse. In the depiction, a male flies over the next where a female is guarding a group of hatchlings. Busiek’s design is exclusive to the Gold American Eagle. Don’t hesitate to reach out to Silver.com with any questions. You can reach us at 888-989-7223, connect with us online using live chat, or send us an email. To see similar products, visit our Gold American Buffaloes page.